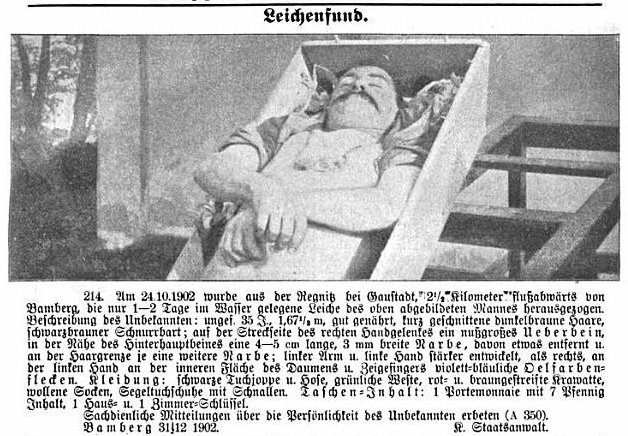 While doing some random Google searches, I stumbled upon a fascinating resource on Google Books – the Bayer[ische] Zentral-Polizei-Blatt, or the Bavarian Central Police newspaper. In short, Bavaria’s Most Wanted. While my German language skills are lacking, it seems that this paper was distributed throughout Germany and perhaps neighboring countries – presumably to police departments. Each edition lists many individuals that are wanted by the police for various crimes or for further questioning, or they are wanted by the court to serve their time. The paper is a multi-purposed resource: a “Wanted Dead or Alive” for criminals, a “Beware” list of shifty characters, and a “Who is This?” for unidentified persons. Some listings are quite detailed and others are brief, but many include the person’s physical descriptions, identifying information such as birth dates, birth places, and occupations), and occasionally even photographs of the individuals. The collection found on Google Books was digitized from originals at Harvard University’s Law Library. The collection includes papers published in Bavaria from 1866 to 1910. The paper does not include the type of information about the crimes that a newspaper account would, but the brief descriptions left me wanting to know more. One particularly intriguing crime is “returning from exile” – which seems to indicate that perhaps exile from the country is a punishment for one crime and returning early is another crime on top of it. Is that similar to breaking parole? Naturally, the individuals I became most fascinated by were those that had their photographs printed in the paper. I found quite a few great stories browsing through the 1903 edition. Many photos were the typical “mug shots” – front and side view like you see today. Bayer. Zentral-Polizei-Blatt, 1903, page 631. Unknown man wanted for grand larceny. 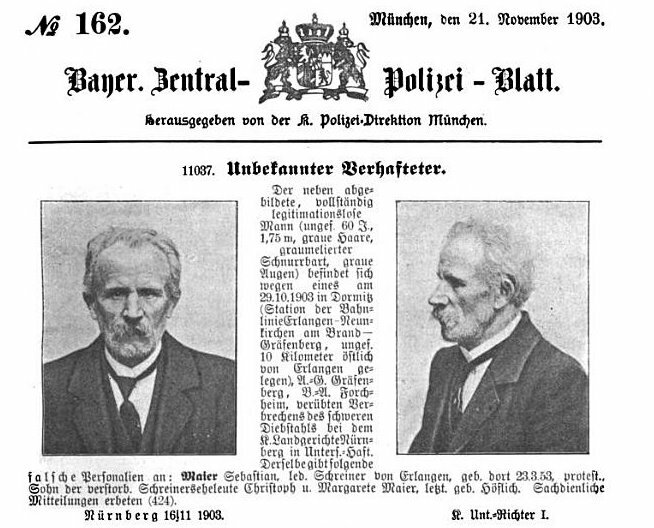 Under the headline “Unbekannter Verhafteter” – “Unknown Arrested”, this man is described as being approximately 60 years old, 1.75 meters tall, with gray hair, graying mustache, and gray eyes. He committed grand larceny – either at the Neunkirchen train station or else that is where he was last seen. The courts believe he might be a carpenter named Sebastian Maier, who was born on 23 Mar 1853 to Christoph and Margarete Maier. Bayer. Zentral-Polizei-Blatt, 1903, page 581. Mr. & Mrs. Ellenrieder from Munich. 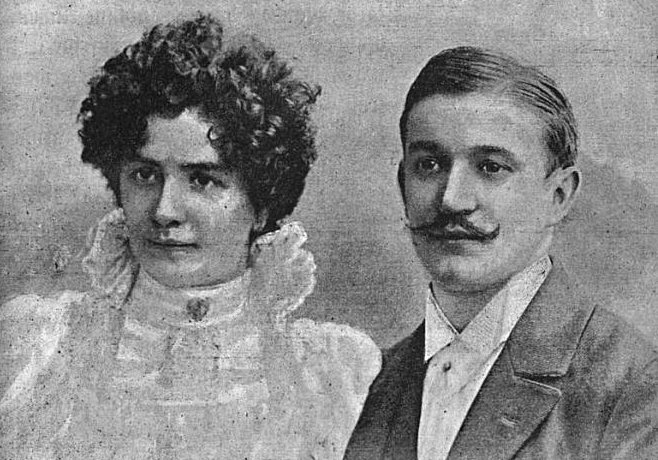 This is Hugo Ellenrieder, a banker from Munich (born 1871), and his wife Elise (born 1876) nee Kahl. The happy couple are traveling together – apparently away from Munich, where they are wanted for a fradulent admission of bankruptcy. Bayer. Zentral-Polizei-Blatt, 1903, page 13. Unidentified victim pulled from a river. This poor guy is not a criminal, but an unidentified body found in the river near Bamberg. Since the police were unable to identify the body, they printed a the photo as well as a detailed description including scars on his body and the clothes he was wearing. His pocket contained a wallet with 7 pennies and one room key. Just browsing through one year’s worth of the Bayerische Zentral-Polizei-Blatt and looking at only the stories with photos would provide me with several interesting blog posts. There were sad stories like the deaf and dumb man wanted for vagrancy or the entire Gypsy family, parents and four children, wanted for begging. These two particular crimes seem to show up frequently, and the culprits seemed to be foreigners, mentally ill, or deaf. Occasionally the paper had photos of missing people. One of the sadder ones was a photo of a cute young boy who had been missing from his home for months. As I wondered about “the rest of the story” for these individuals, I came upon a surprise – a name I knew. I don’t know the beginning of the story or the circumstances of the crime, but here was one tale I could tell further! Stay tuned for my next post to learn more about the relative I found listed in Bavaria’s Most Wanted. Bayer[isches] Central-Polizei-Blatt. Published 1903. Original from Harvard University, digitized August 5, 2008. Accessed via Google Books: http://books.google.com/books?id=4cAqAAAAYAAJ. Bavaria. Pfaffenhofen an der Ilm, 3 July 1813. The big storm that occurred in our town on 30 June caused a great havoc, since the lightning that accompanied him seems to have uniquely discharged only here. The clouds stood so low that one flash of lightning followed another, and almost every flash fell down on earth but mainly fell on the high-pointed tower of the town’s church. A lightning flash hit a barn filled with straw in a side alley, which immediately ignited nine other hay and straw-filled barns that were mostly very old already and not well built. Despite very nearly all the possible obstacles of nature united so that even the most determined men gave up all hope of rescuing even one single house throughout the city, every attempt was made with the greatest consternation to stop the fire line that was spreading with enormous speed during the continuing storm, which turned in all directions in rapid alternations, and with the rain pouring down where you could barely see what was in front of you. Miraculously, after the toughest six-hour battle against the violent storm wind, the flames were pushed down on the floor and prevented from spreading further; the fire itself could only be put off today. The courage in the apparent dangers, the skill and presence of mind of Master Carpenter Nigg and Master Mason Pickl, which both have distinguished themselves so often in similar cases, could not be praised enough. The fire would not have burned down so many buildings if these old buildings were not built so badly and if they had been equipped with proper fire walls. As lucky as the town was with this great misfortune, the damage that was suffered on the buildings and the carriages can be estimated at approximately 80,000 fl., not considering the fire insurance sum of 14,000 fl. for a total of 5 houses, 4 stables and 9 barns. Several smaller building nearby were enflamed which included the buildings of three farmers, that of Franzbräuer, Kreitmaierbräuers and Zuhammers. However, no one was seriously injured during their work. According to news received from the state court, this terrible thunderstorm was spread over many miles and caused great devastation in the forests and woods. The lightning hit very often, but nothing else was set on fire. Highly remarkable is the strange fact that two years ago on 01 July, a similar thunderstorm along with a tornado-like storm caused great devastation when a lightning strike hit the church tower of Pfaffenhofen, set a farm in the area on fire, and caused a damage of at least 50,000 fl. due to a severe rainstorm and hail. On 30 June between 9 and 10 in the evening, a severe thunderstorm and hailstorm developed in the area of Regensburg, but it caused no significant harm in the area near the city. The storm that accompanied the thunder storm, however, destroyed century-old lime trees along the surrounding walk ways and tore down many fruit trees in the gardens within the neighborhood. Two hours later, a torrential thunderstorm erupted in the area of Karlovy Vary (Bohemia). The reason I was drawn to this story? Master Carpenter Nigg, one of the two named men credited with fighting the fire, is my 4th great-grandfather. Since I have difficulty finding my 20th century ancestors in newspapers, imagine my surprise when I found an ancestor in the press who lived from 1767 to 1844! I’m happy to know that he was well-regarded in the town for his courage, skill, and “presence of mind” and that it did not appear to be the first time he distinguished himself in that manner. The storm of 30 June 1813 and the resultant fire must have been terribly frightening for his family. At the time, Karl Nigg and his wife Maria Höck had eight young children. While I am not entirely sure if all eight children were still living since infant mortality was high at the time, at least one child was alive – my 3rd great-grandmother, Magdalena, who was six years old at the time of the storm. Many thanks to my friend Marion for the translation. I broke up some of the paragraphs and sentences for easier reading. And I can’t believe I was able to find a perfect post to actually use “It was a dark and stormy night” for the title!